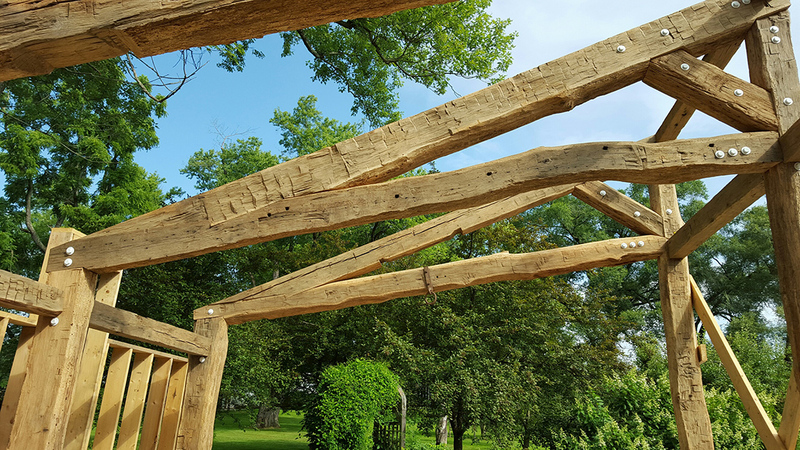 Load-bearing antique (200 year old) White Oak timbers, the primary structural members for the new additions on the Expansion Pack, add material warmth and a contextualizing element to the project. 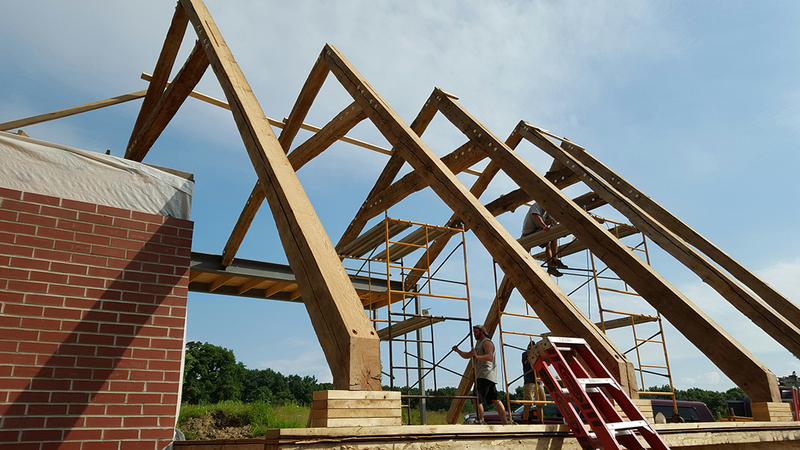 Timber framing is ever-present in the local vernacular architecture of Western Pennsylvania. 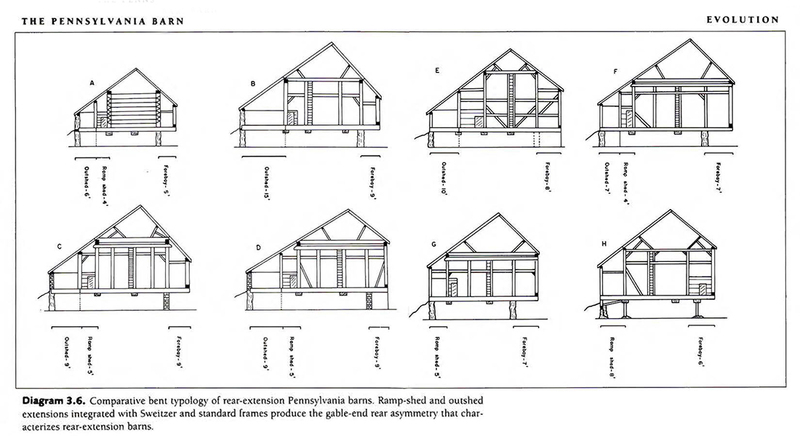 The below diagram shows the formal evolution of framing techniques in Pennsylvania barn typology. This is a house I designed for my family, in collaboration with my friend and fellow architect Yvonne Riggie. The project owners had salvaged and stock-piled the 200 year old timbers from a collapsed neighboring cabin. As a youngster I hid amongst these stacked antique timbers and played in the hay bales stacked against the timber beams of the large Pennsylvania bank barn on the project property. 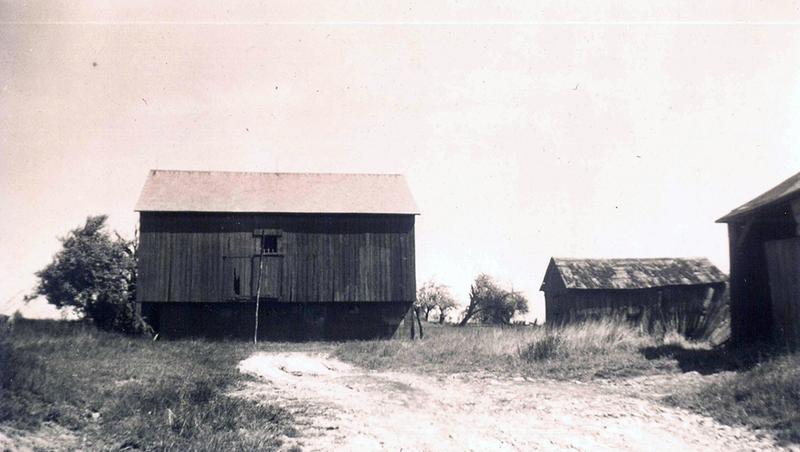 1943 photo of the property bank barn. Old iron tracings & new baseplate detail on the Pittsburgh project. Working with the Pennsylvanian firm of Lancaster Country Timber Frames and Pittsburgh engineer John Schneider, we designed a structural system that capitalized on the unique character of the timbers and leaves them exposed. Old iron straps, pulleys and joinery traces were left intact and celebrated, as were the natural bows and bends of the timbers. 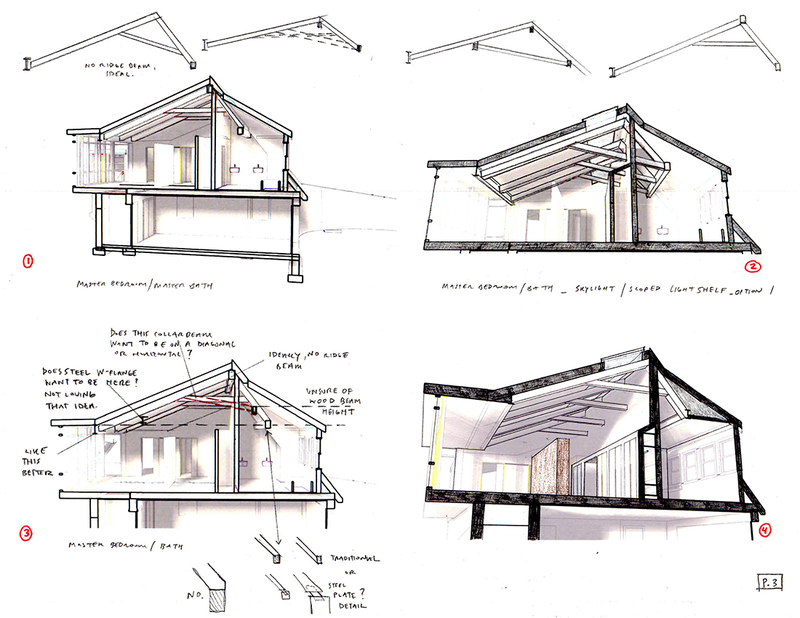 Due to the time spent working for the acclaimed Bay Area engineer, Paul Endres, it has always been important to me to accentuate and expose structure. I also had the good fortune to study under Peter McCleary at the University of Pennsylvania, a structural engineer who worked alongside Robert Le Ricolais. Wide-flange steel beams, exposed steel channels, fasteners, and exposed connections are details that excite me. 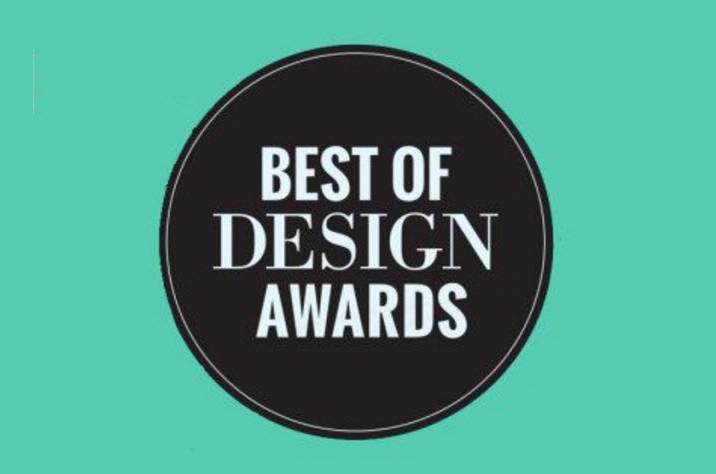 These influences encourage me to celebrate the design opportunities inherent in the marriage of exposed structural design and engineering with architecture, in much the same way that I try to blur the boundaries of architecture and landscape architecture. The following are design drawings/explorations undertaken in the design phase to parse out the project structural system on the Pittsburgh project. 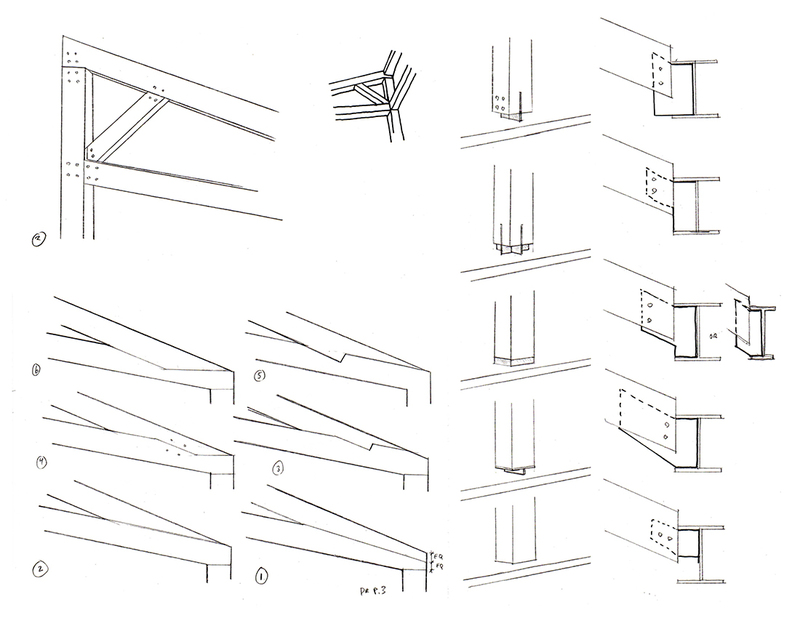 They show several design iterations, roof geometries and a myriad of connection options: splice plates, joinery connections, and base plates. 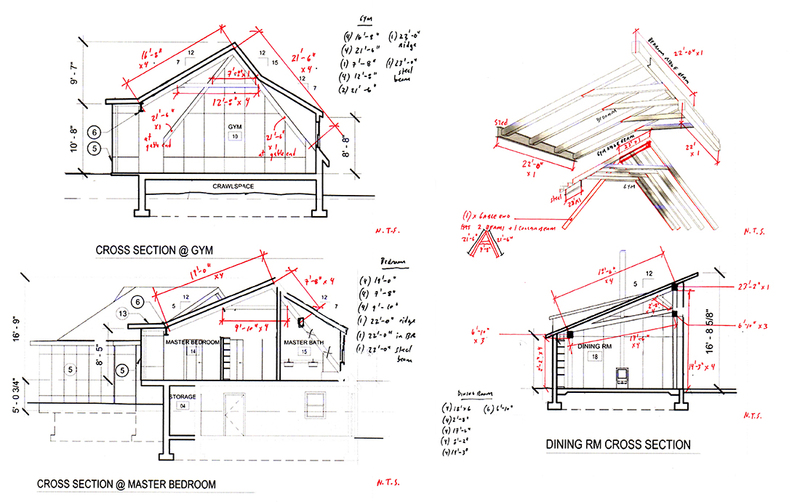 It was a joy to be able to seamlessly work with an experienced structural engineer who shared our interest in the exposed structural design of the timber framing. John Schneider PE was an invaluable asset in not only the design process but in the material testing and grading of the beams. I was fortunate enough to find John through a search that began with my knowledge of the Meadowcroft Rock Shelter and the Pittsburgh History Center, a venerable and beautiful old timber-framed warehouse that was used to store Lake Chautauqua ice from upstate New York for distribution in Pittsburgh. I was impressed by John’s work on these two buildings and cold-called him to inquire as to his availability. 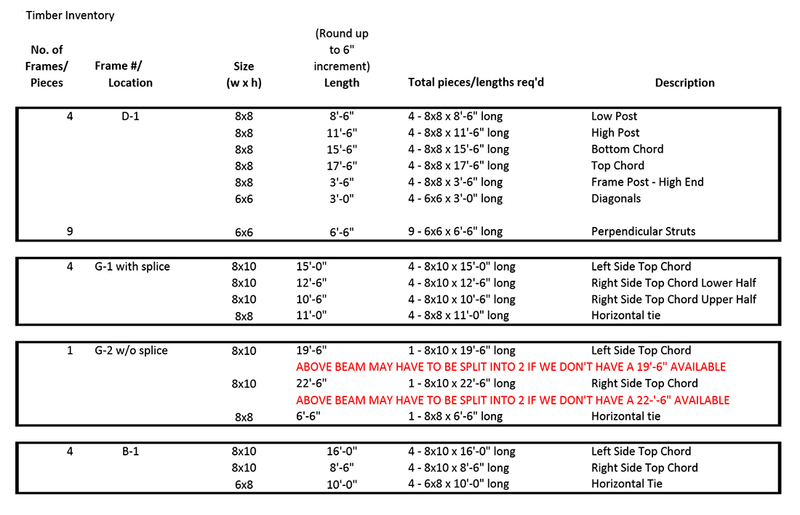 His input on required span and loading calculations, bolt spacing, plate size, and capacity factored into each connection. Each connection detail was explored as a celebratory moment of materials meeting. Confirming the tree species of White Oak with boring samples analyzed by a lab allowed Schneider to assess for timber strength for loading calculations in conjunction with finding spans we had parsed out in schematic designs. All timbers were laid out for visual inspection, strength assessment, and determination of insect/rot damage. To confirm timber lengths and spans, the next step was to drag all of the stockpiled timbers out into one of the fields to measure and visually inspect them for damage. While insect damage and dry-rot had spoiled quite a few of the members, there were also incredible discoveries: traces of old use in the form of joinery cuts, old iron straps, pulleys and markings which were left intact in the final layout for their added character. 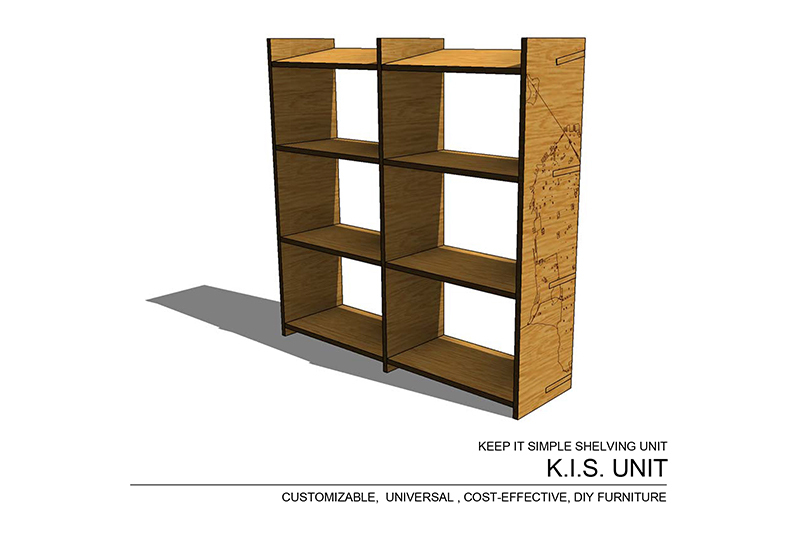 Keeping accurate timber inventories alongside required design spans became an integral aspect of the project. 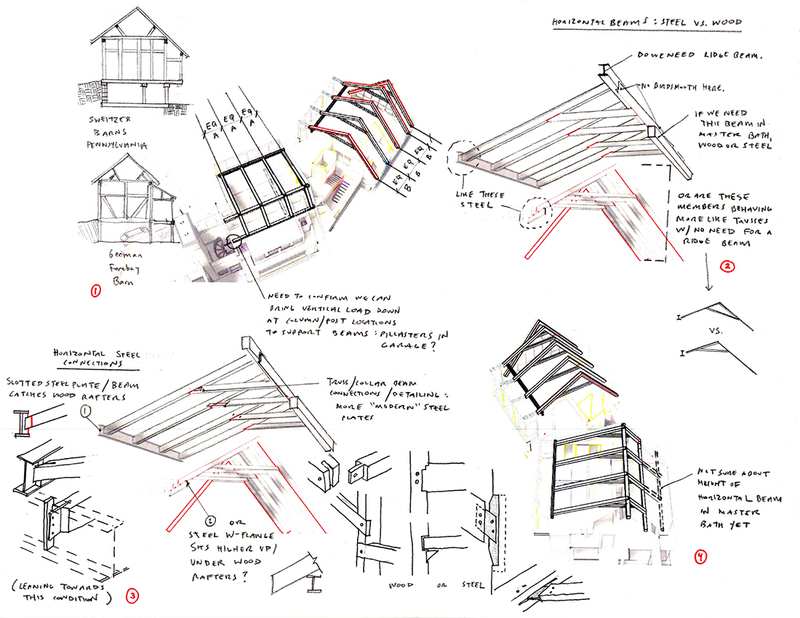 The need for long spanning beams coupled with necessary removal of occasional mid-span rot in the old timbers, ensured a constant give and take between usable timber beam inventory and design intent. While we were able to source additional infill oak timbers from LCTFs to fill in gaps, material availability impacted design. While we involved an inspector to visually grade the timbers, it was John Schneider’s buy-in, experience, and skill at calculating the loads and capacities of the beams that eased the re-use of these antique materials. 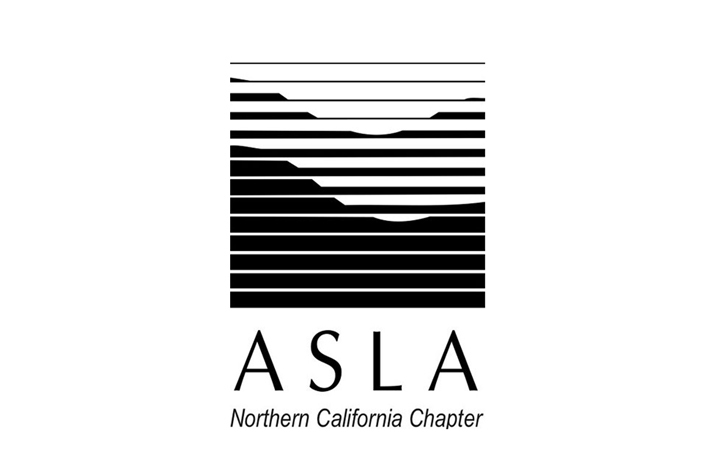 Upon client design acceptance and completion, further beam treatment occurred in the form of corn-cob blasting (shooting slightly malleable corn cob husks at the beams to gently remove loose debris) and fumigation (a borate glycol spray to ensure bug elimination). Corn cob blasting and borate application. For beam erection and design input, we worked with the reputable, experienced and amiable folks at Lancaster County Timber Framers of eastern PA. LCTF compiled shop drawings based on our design, assembled the beam frames in their workshop and erected them on site, ensuring quality control throughout the entire project. One of the most enjoyable aspects of the project was the design dialogue we were able to undertake with Tony Zaya and Josh Coleman of LCTF. Also of note, the clean, minimalist steel window walls manufactured by the venerable firm of Hope’s Windows in Jamestown NY allowed the timber framing design elements to shine. 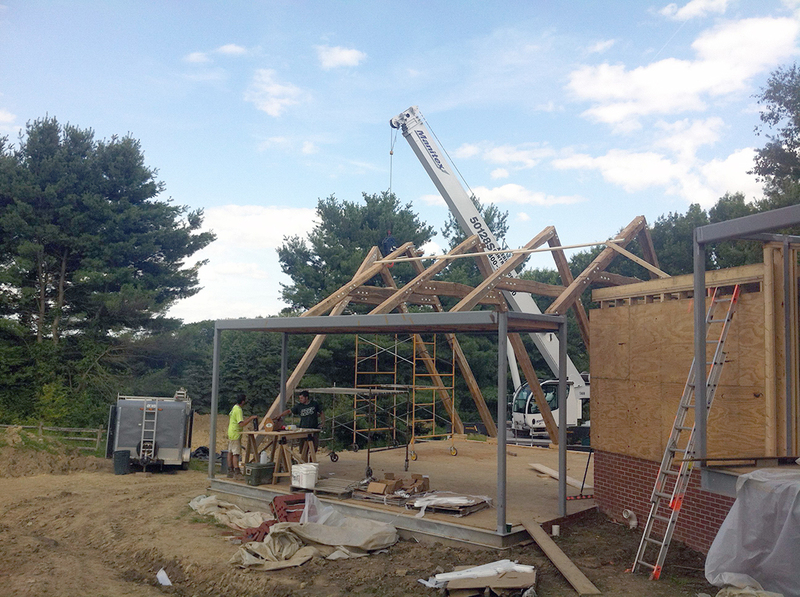 Beam Layout at the Lancaster Country Timber Frames shop. Josh Coleman and Tony Zaya of LCTF were a joy to work with. The frame erection took 3 days and involved laying out the frames on site, craning them into place, and ensuring alignment with pre-welded steel tabs on the steel support beams. Utilizing reclaimed timbers for use took extra effort, client patience and increased project time but added historical intangibles to the interior spaces and exterior views.